We’ve just returned from our Halloween trip to Disney World and let me just say the Mickey’s Not-So-Scary Halloween Party was definitely my favorite part of the trip! Be sure to pick up a Park Guide Map as you enter the Party for a full list of the Entertainment Times, Treat Locations and more. There are items sold at the Mickey’s Not-So-Scary Halloween Party(MNSSHP) that are exclusive to this party only!! On top of that, only a certain amount is made so when they run out…they’re gone for good. Exclusive MNSSHP T-shirts, trading pins, Mickey Ears, etc…can be found in the Emporium, Big Top Souvenirs, Mickey’s Star Traders and Frontier Trading Post. Main Street USA is spooktacular from top to bottom during the MNSSHP. I went Live on Facebook while on Main Street USA! Click Here to check it out! Haunted Mansion Dessert Tarts throughout select locations in the park, and many, many more!! Be sure to pick up your MNSSHP park guide for all listed locations and Halloween treat locations! Just like the Mickey’s Very Merry Christmas Party, there are plenty of freebies at the Mickey’s Not-So-Scary Halloween Party!! Trick or Treat Locations are set up around the park (also listed on your park guide map) with an inflatable candy corn to mark the spot. Treat bags are handed out as you enter the park, or if you’re like us and you are so excited to see the castle that you completely miss those handouts we got ours at the treat locations. It was so much fun to say, “trick or treat!” and feel like a kid again!! Just a few of the Magic Shots offered at the MNSSHP are the Headless Horseman outside of the entrance to the Magic Kingdom, Ghosts from the Haunted Mansion are located at the pumpkins near the flagpole, and the Poison Apple and Cauldron are offered down Main Street USA. Other Magic Shot locations are listed on your park guide map. 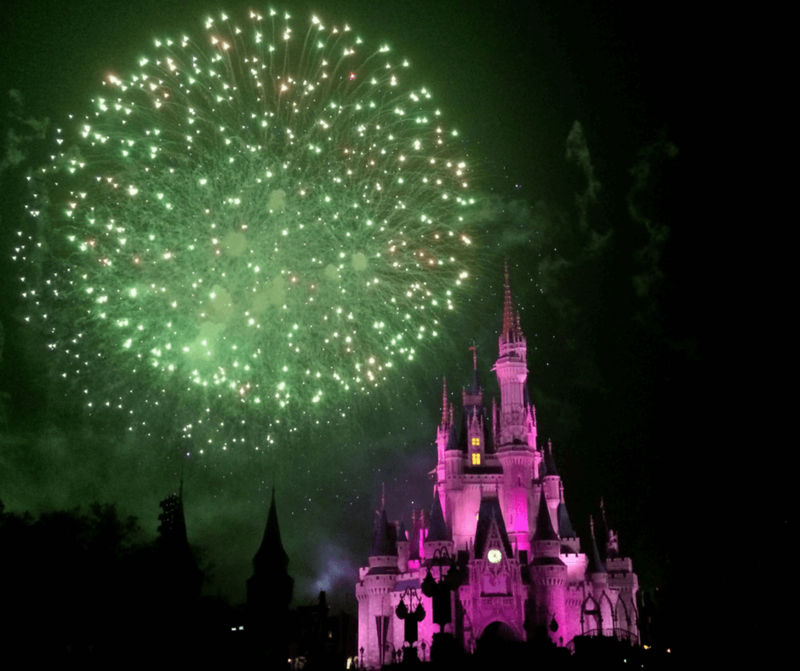 If you’re not familiar with the Magic Shots at Disney World Click Here for more info. There are many attractions available during the party, and while some of the popular attractions like Space Mountain will still have long wait times, for the most part, all the rides are a short wait if a wait at all. The last time I saw this parade was in 2009 and even though there were still some familiar parts, the new floats like Wreck it Ralph were definitely a site to see….and smell!!!! Man, Disney goes all out!! The Boo-to-You Halloween Parade will surely leave you singing 🎶Boo-to you, and Boo-to-You🎶 the rest of the night!! Mickey’s “Boo-to-You” Halloween Parade is shown at 9:15 pm and 11:15 pm giving you no reason at all to miss the spooktacular event!! The Sanderson Sisters are back!…and there’s “heck” to pay!!! Join the Hocus Pocus sisters as they try to conjure up a new spell along with all your favorite Disney Villains. This show was my favorite of everything we did at the party!! The Hocus Pocus Villain Spelltacular is shown 4 times during the MNSSHP: 7:40 pm, 8:35 pm, 10:45 pm and 12:00 am. Shocker I know!! If you haven’t seen the movie, definitely see it before going to Mickey’s Not-So-Scary Halloween Party!! The Disney Villains take over the skies above Cinderella Castle with this chilling fireworks show. and many more Disney Villian’s appear in a frightful take over of the Magic Kingdom….and Mickey’s Halloween Party!!! FastPasses are NOT available during the MNSSHP hours and PS…you don’t need them. We walked on most of the rides available during the party with minimal to no wait at all! Allergy friendly treats are available. See a Cast Member for more details!! are having a cute dance party to celebrate Halloween! Don’t forget to pick up a Mickey’s Not So Scary Halloween Party park map guide. They are available at the park entrance as well as at the counters of most shops inside the park. This park guide will help you find all of the events and entertainment mentioned above. Insider Tip: You can get into the Magic Kingdom park at 4 pm on the day of the MNSSHP…that’s 3 extra hours of fun. You can schedule FastPasses during that 3 hour time period before the party actually starts at 7 pm. I highly recommend this special ticketed event at Disney’s Magic Kingdom for kids and adults alike. We had so much fun I know we will be back for more Halloween at Disney World fun next year! Have you been to the Mickey’s Not-So-Scary Halloween Party before?!? Comment below and let us know what your favorite part of the party was!